I created a sprite sheet for Kris using Kotone's as a base. Is it possible for someone to make a mod to replace Kotone with Kris? And would anyone here be interested? 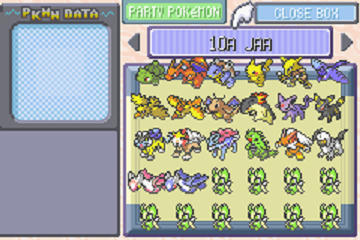 Can't we complete the Pokemon Platinum Pokedex? Guys, I can't to complete the pokedex using the Pokemon Platinum Pokesav. Is everyone having the same problem as i do? THX in advance. I want a sav file with a complete national pokedex. I tried doing it myself, but failed. WHen I ticked both sinnoh and sinnoh+national it didn't work, then I tried just sinnoh, then just sinnoh+national but didn't work. So, I just want to start fairly in the beginning, like in twinleaf town or sandgem or something, but not a finished game... THANKS. How can I complete my dex by Platinum?